This is a sponsored post written by me on behalf of JOHNSON'S Baby and We All Grow Latina, as always all opinions are my own. How excited are we for Halloween? Pretty darn, if you ask this sassy little witch. 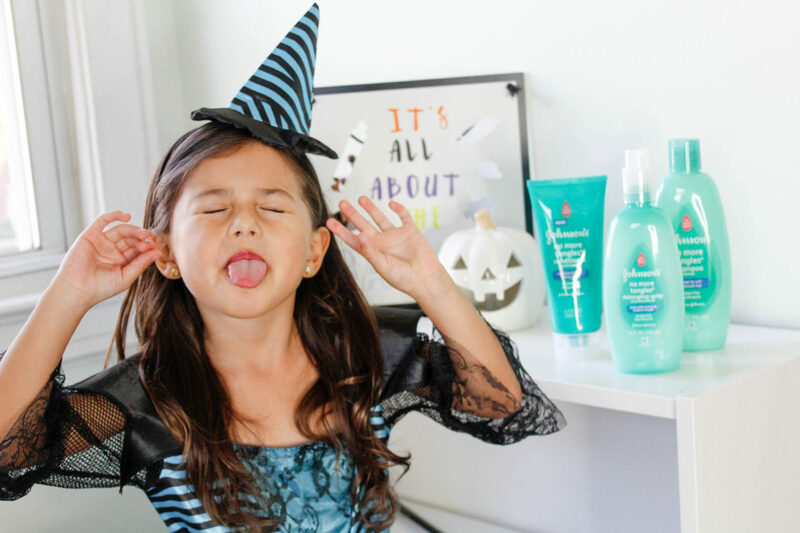 This week I've partnered up with Baby Johnson's to bring you the latest #tangletalk for this Halloween's spookiest hair styles. I am so happy to be able to share my latest obsession with their No More Tangles line of products! For the most part Camila is a pretty easy going kid. She isn't picky with food, she gets along well with others and for a three year old she's pretty well behaved. My only issue, at the moment, is her God forsaken hair! Not because she's my kid or anything, but she honestly has the most beautiful hair! It's falls soft, long and has the prettiest most perfect curls at the ends BUT its very thin making it prone to tangles! I literally have to chase her around the house to brush her hair – while she cries of course. This week we tried the Baby Johnson's three step regimen for beautiful tangle-free and nourished hair and it honestly made the biggest difference. Not only was Camila's hair more manageable but it was softer, shinier and it smelled so fresh! As you can see she let me comb her hair without a single tear, mine or hers! She was so excited with her costume that she was ready to go and "trick or treat" her little heart out but Halloween's not till Monday! 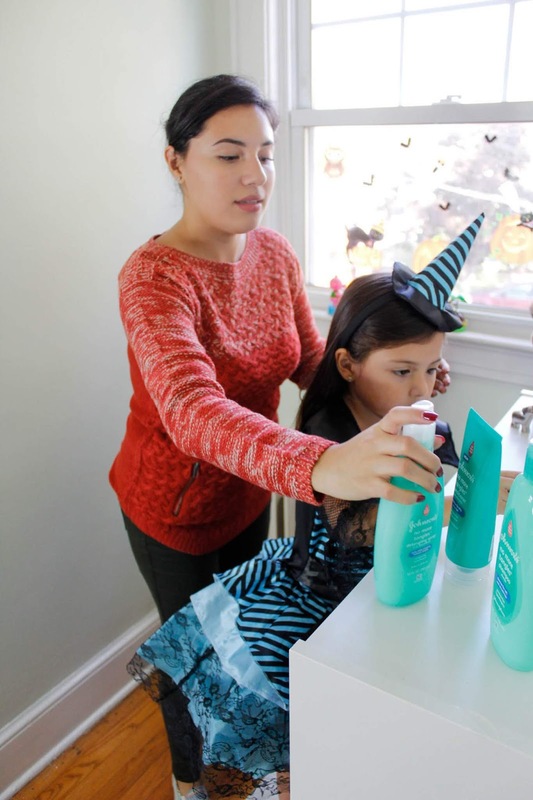 I am so happy to have been able to test these products out with my little munchkin, she's glad that I'm not chasing her around with a comb and we're both delighted with the results. Baby Johnson has been around for as long as I can remember and just like all of their products these are made with their award-winning No More Tears formula and best of all do not contain any parabens and are always allergy tested. Since growing hair can tangle easily, we encourage you to test out the Baby Johnson's No More Tangles line! 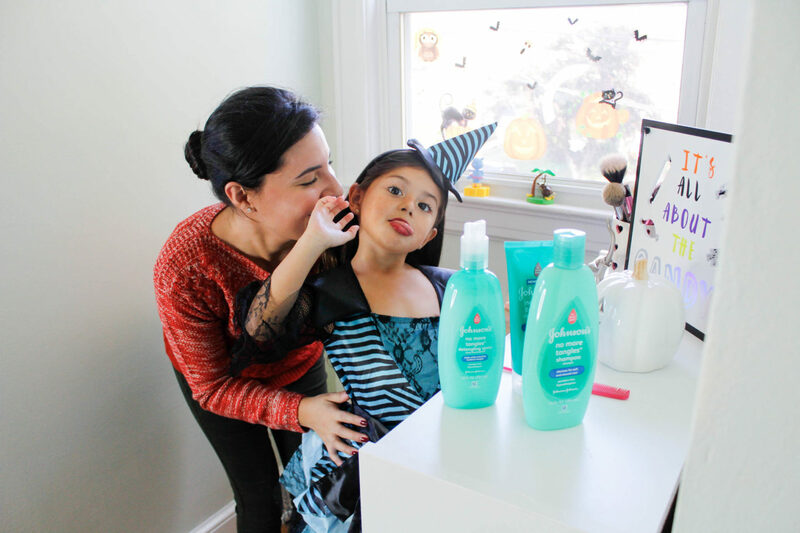 It gently cleanses and detangle making our mommy duties just a little bit easier! We hope everyone has a happy and safe Halloween!